Six months from now, where do you see yourself? It may seem like a far distant future, but think back to what you were doing just six months ago and you’ll realize just how fast time flies. If you are someone who has spent your entire life displeased or embarrassed by the appearance of your teeth, imagine how wonderful it would feel to know that six months from now you could have a completely remade smile. Well, at Watson Dental Care, we can make it happen. With the Six Month Smiles treatment, you’ll have a completely new smile and be incredibly happy with how your teeth look. 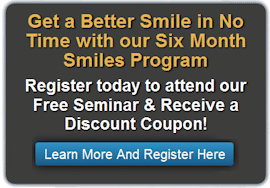 To learn more about Six Month Smiles, contact Watson Dental Care today at (407)351-3213. We’d be happy to schedule your appointment or answer any questions that you have about this life changing treatment. One of the most common reasons that people don’t get braces is because they feel as if it’s a treatment that takes too long to work. Luckily, the Six Month Smiles treatment has taken a modern spin on the traditional braces procedure. Instead of taking years to work, this treatment uses braces to straighten your teeth and give you a more attractive smile in just six months. What’s even better about the Six Month Smiles treatment is that the braces come with Lucid-Lok® clear brackets resembling the appearance of your natural teeth, so they are hardly even visible to your family and friends. If you’ve been avoiding braces because you’re afraid the treatment takes too long or because you don’t like the look of metallic brackets in the mouth, then you’ll be pleased to know that Six Month Smiles is the ideal treatment for you. In addition, finally straightening your teeth will help you to alleviate any other dental issues that you may be experiencing. In just six months, you could have a drastically different oral foundation, but that’s only the case if you start the process today. How Will You Look In Six Months? It’s human nature to have a hard time seeing too far down the road. Instead, we typically look at the here and now, without realizing that tomorrow is coming whether we like it or not. The question is, how do you want to look six months from now? Do you want to still be living with the uneven and crooked teeth that embarrass you? Or do you want to make an influential change that will drastically alter the way you smile. If you’ve waited long enough and you are finally ready to get on the road to having more beautiful teeth, don’t wait any longer. Give Watson Dental Care a call today at (407)351-3213. We will be happy to speak with you some more and provide you with any information that you need about Six Month Smiles. And if things go smoothly, we’ll happily schedule your appointment to get you into our office for the smile makeover that you’ll truly love.